Volunteer orientation is open to any member of a Southern Baptist church who is at least 18 years of age. Attending orientation does not obligate you to serve, but is necessary before serving. 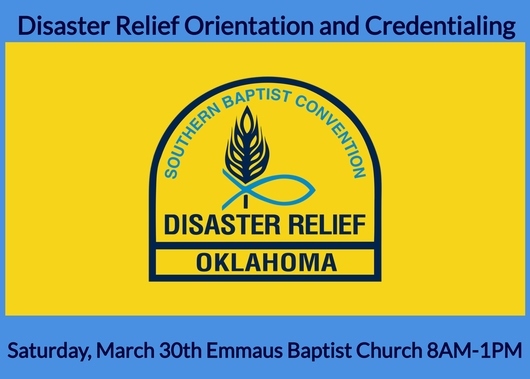 A Disaster Relief ID badge will be issued to those who complete orientation and a background check. Updating an expiring/expired badge requires EVERYONE to complete orientation and a background check; currently, every five (5) years. Feeding, Chainsaw, Shower/Laundry, Damage Assessment, Formstack, Initial Contact Person, and Recovery Training. Damage assessment, and Formstack Training are limited to returning team members who have completed prerequisites. The Orientation will last from 8AM-1PM and Lunch will be provided for free!